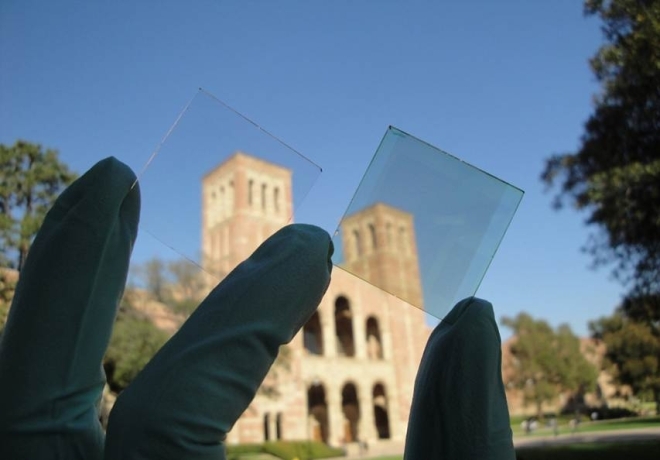 UCLA researchers have developed a new transparent solar cell that is an advance toward giving windows in homes and other buildings the ability to generate electricity while still allowing people to see outside. Their study appears in the journal ACS Nano. The UCLA team describes a new kind of polymer solar cell (PSC) that produces energy by absorbing mainly infrared light, not visible light, making the cells nearly 70% transparent to the human eye. They made the device from a photoactive plastic that converts infrared light into an electrical current. "These results open the potential for visibly transparent polymer solar cells as add-on components of portable electronics, smart windows and building-integrated photovoltaics and in other applications," said study leader Yang Yang, a UCLA professor of materials science and engineering, who also is director of the Nano Renewable Energy Center at California NanoSystems Institute (CNSI). Yang, who is also the holder of the Carol and Lawrence E. Tannas, Jr., Endowed Chair in Engineering, added that there has been intense world-wide interest in so-called polymer solar cells. "Our new PSCs are made from plastic-like materials and are lightweight and flexible," he said. "More importantly, they can be produced in high volume at low cost." Polymer solar cells have attracted great attention due to their advantages over competing solar cell technologies. Scientists have also been intensely investigating PSCs for their potential in making unique advances for broader applications. Several such applications would be enabled by high-performance visibly transparent photovoltaic (PV) devices, including building-integrated photovoltaics and integrated PV chargers for portable electronics. Previously, many attempts have been made toward demonstrating visibly transparent or semitransparent PSCs. However, these demonstrations often result in low visible light transparency and/or low device efficiency because suitable polymeric PV materials and efficient transparent conductors were not well deployed in device design and fabrication. A team of UCLA researchers from the California NanoSystems Institute, the UCLA Henry Samueli School of Engineering and Applied Science and UCLA’s Department of Chemistry and Biochemistry have demonstrated high-performance, solution-processed, visibly transparent polymer solar cells through the incorporation of near-infrared light-sensitive polymer and using silver nanowire composite films as the top transparent electrode. The near-infrared photoactive polymer absorbs more near-infrared light but is less sensitive to visible light, balancing solar cell performance and transparency in the visible wavelength region. Another breakthrough is the transparent conductor made of a mixture of silver nanowire and titanium dioxide nanoparticles, which was able to replace the opaque metal electrode used in the past. This composite electrode also allows the solar cells to be fabricated economically by solution processing. With this combination, 4% power-conversion efficiency for solution-processed and visibly transparent polymer solar cells has been achieved. "We are excited by this new invention on transparent solar cells, which applied our recent advances in transparent conducting windows (also published in ACS Nano) to fabricate these devices," said Paul S.Weiss, CNSI director and Fred Kavli Chair in NanoSystems Sciences. Study authors also include Weiss; materials science and engineering postdoctoral researcher Rui Zhu; Ph.D. candidates Chun-Chao Chen, Letian Dou, Choong-Heui Chung, Tze-Bin Song and Steve Hawks; Gang Li, who is former vice president of engineering for Solarmer Energy, Inc., a startup from UCLA; and CNSI postdoctoral researcher Yue Bing Zheng. The study was supported by the Henry Samueli School of Engineering and Applied Science, the Office of Naval Research, and The Kavli Foundation.